Caption: Dr. Michele Frazer, the paitient's Medicine doctor right in blue, takes over the patient's care while Dr. Hunt continues to work on the mare and C-section surgery. NO NAMES unless Hagyard/Claire Novak confirms. Mare Soaring Softly is walked from Medicine to Surgery for a C-Section surgery. She would have an Awesome Again. The mare and colt were taken back to Medicine for care, where the foal was placed on a nurse mare. 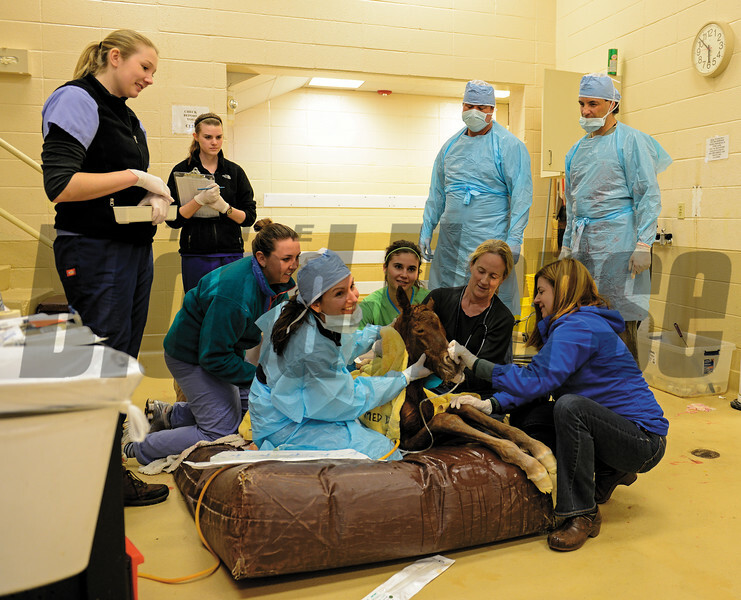 The neonatal unit or NICU at Hagyard Equine Medical Institute in Lexington, Ky. on Sunday, March 17, 2013, and an emergency C-section surgery.